S’mores are popular for good reason — their sweet combination of melty chocolate, gooey marshmallows, and crunchy graham crackers. But there are more ways to enjoy this delicious combo than around a campfire. Here are some new ways to get your s’mores fix this winter — no camping required! 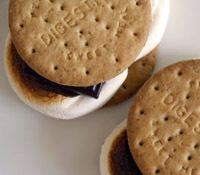 There's no need for graham crackers when you're looking for a s'mores fix — digestive cookies are a delicious diversion. These are made in the oven — no need for a campfire! 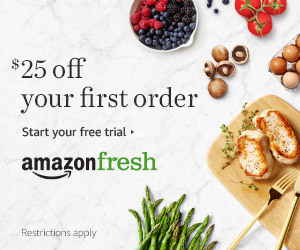 Family Kitchen has the recipe! 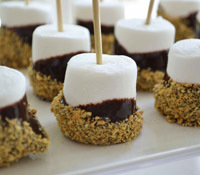 Perfect for parties, large marshmallows are dipped in chocolate and then graham crumbs — a fancy sweet you can eat on a stick, making them reminiscent of campfire treats! 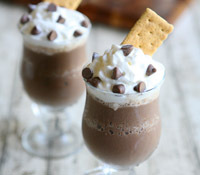 These sweet, creamy smoothies are like chocolate milkshakes, only better — made with marshmallow fluff and topped with whipped cream, chocolate, and a graham cracker! 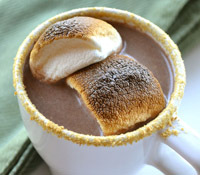 S'mores made sippable — rich hot chocolate topped with toasted marshmallows, with a graham cracker rim! 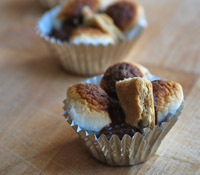 These sweet treats taste just like the campfire treat, in bite-sized mini muffin cups. Perfect for parties! Click here for more s'mores recipes.